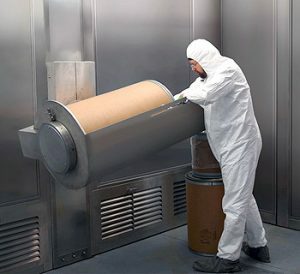 We can provide Drum Sampling and Powder Weigh Containment Booths which are designed, engineered and manufactured to the highest standards utilizing state of the art design and manufacturing processes and techniques. These systems are constructed of a minimum of 16ga. 304 or 316L stainless steel with a #4 finish on all exterior surfaces. Special attention is taken to create seamless surfaces within the chamber. High volume HEPA filtration at low wall exhaust collection intakes is standard. Down flow supply air is HEPA filtered to provide Class 100 conditions within operator breathing zones. Fine particle Pre-filtration is provided at exhaust intakes downstream of HEPA filters. Multi-staged pre-filtration is also available. Complete control and alarm systems are standard and containment booths can be configured for single pass exhaust or re-circulating operation. All critical containment systems are designed specifically to individual customer process and containment specifications and safety requirements.